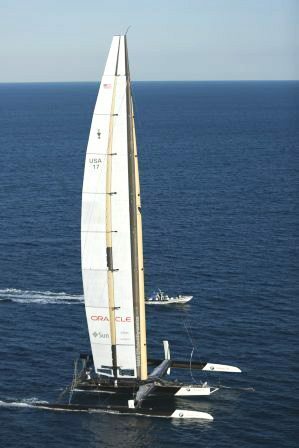 C omposites manufacturer Janicki Industries provided tooling for most of the carbon fiber components of the BMW ORACLE Racing yacht – the winner of the 33rd America’s Cup. Most recently, the company manufactured molds for the wing sail, giving BMW ORACLE Racing a technological breakthrough in the yacht’s maneuverability and speed. Sedro-Woolley, WA (PRWEB) April 8, 2010 — The 33rd edition of theAmerica’s Cup competition was especially sweet for Janicki Industries this year when USA crossed the finish line to win the oldest trophy in sport. 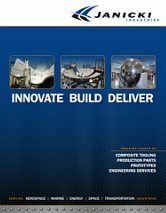 Composites tooling specialists at Janicki Industries are avid fans of the BMW ORACLE Racing team and have been involved in the America’s Cup competition for nearly ten years. Working with Core Builders of Anacortes, WA, the team’s custom boatbuilding facility, Janicki provided tooling for most of the carbon fiber components of the racing yacht originally called BOR 90 (aka Dogzilla) and finally named USA. Most recently, the company manufactured molds for the wing sail on USA, giving BMW ORACLE Racing yet another technological breakthrough in the yacht’s maneuverability and speed. The wing sail is made of carbon fiber and Kevlar with an aeronautical film material skin over the frame. According to Joseph Ozanne, an aeronautical specialist with the BMW ORACLE Racing design team, the ability to easily trim the wing is one of its big advantages over a soft sail. Janicki code-named the highly secretive wing sail project “Kopis” after a Greek sword with a forward curving blade. Staffers regarded the wing sail project as a “once in a lifetime opportunity” and agreed the name proved fitting. The BMW ORACLE Racing wing sail is 223 feet long, more than twice the span of a Boeing 747 wing. This entry was posted in Uncategorized on April 8, 2010 by fdgadmin.